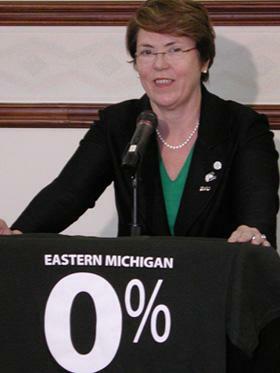 Eastern Michigan University (EMU) President, Susan Martin publicizing the school's announcement that they would not increase tuition rates this year. Now the University faces the possibility of a strike. The union representing Eastern Michigan University faculty may ask for a strike authorization if its contract demands are not met by midnight Tuesday. EMU classes are scheduled to begin September 8, but union representatives say teachers may not be there if no contract agreement is reached. EMU faculty are no strangers to walkouts: They went on strike in 2000, 2004 and 2006. Howard Bunsis is with the union. "Right now, they're asking for roughly a 2% pay cut, and this is all due to the out-of-pocket health costs that they're imposing on us," Bunsis says. "They're asking a family of four or five people to pay two to three thousand dollars more in premiums than they're currently paying." EMU announced a 0% tuition increase for this school year. Bunsis says that's resulted in more students and more revenue for the university.